Y’all know I’ve converted over my two member sites to HTTPS already. Well now it’s time to convert the main BlogAid site. No cobbler’s children excuses here! I’ve had to run some tricky settings in CloudFlare because they are sub-domains of BlogAid, and some of the tricky redirects don’t always work, depending on the combo you use of https and www or not. So, I need to get the site of the main domain flipped to clear all that up. The site may be in maintenance mode for a bit while I’m changing it over too. The thing that was holding me up from converting BlogAid to HTTPS sooner was the podcast RSS feed to iTunes. I’ve got that feed set up an older way and seriously considered switching to a newer way of doing it and storing files on one of the podcast services. But, decided to keep it the way it is and simply do a redirect for the feed to iTunes. I’ll be doing a quick podcast to test that redirect after the conversion. So, you should receive a show other than Tips Tuesday in your subscription, and now you’ll know why. This week I’ve pretty much been buried in client site work of all kinds and tweaking some of the HTTPS checklists for Webmaster Training members. If you’re on the waiting list for having your site converted to HTTPS, just know that I’m working my way toward you. Be sure to fill out your Ultimate Pre Conversion Checklist and have that info ready to go. You will also want to make a spreadsheet or list of your site functions and links of where they can be tested. Things like your contact form, optin, and any other critical site functions. We’ll be testing them before and after the conversion. Some of my craft and lifestyle blogger clients get a lot of comments on their posts. And because they are evergreen, they can’t really afford to close them after a certain amount of time to help protect against comment spammers either. Besides using an anti comment spam filter plugin, like Akismet, the Google Webmaster blog has a post with more tips that you can use. One of them is installing the Google reCaptcha service. I’m thinking about installing that on my contact forms, instead of the little math quiz captcha I have that Contact Form 7 provides. Some bot form filler outer thingies are able to get right through that protection. Practically every day I get an email from someone wanting to get their article featured in Tips Tuesday. And the from address is by one of those robo filler things. So I just delete it. If I do add Google’s reCaptcha, I’ll make a video tutorial for you. Matt Mullenweg gave his State of Word address at WordCamp U.S. a couple of months ago. Now we get to hear the rest of the story from those in the industries that revolve around the WordPress software. That includes theme designers, plugin developers, and the rest of us who make our living related to WordPress. WP Engine’s webinar with the State of WordPress Industry is Wed, Feb. 1 at 11:00 am CST. That’s noon ET and 9am PT. The whole thing is based on a survey and study from Torque’s editor Marie Dodson. And it includes a panel of leading WordPress experts. I’ll be there and I want to see how closely my own predictions match what this panel sees as the future of both WordPress and the industry. If you want to get a sneak peek at what’s actually coming in WordPress development itself, then read this post on the Make WordPress official blog. As I’ve mentioned in previous Tips Tuesdays of late, Matt Mullenweg himself is taking the reins for WordPress development this entire year. It’s going to turn WordPress on its ear. And once you read this post, you’ll understand why. If you’re a designer or a developer, you better read this post because these changes are going to impact your business directly and radically. And I would strongly suggest you start diversifying your income streams today with services that end users can’t do for themselves, like the very things I teach in my Webmaster Training courses. Folks who know how to do those things are going to weather the coming storm of downturn in business for two reasons. They will be able to offer the services directly and they will be able to partner with designers who didn’t make the effort to learn how to do this stuff. If you want to get a taste of what I mean about WordPress being turned on its ear, read this dev chat from the folks making the decisions and coding up what the new text editor will be like. There are at least 40 comments on what constitutes a paragraph and single line break. StudioPress is getting into the managed hosting business. For $27/mo you get Genesis and your choice of child theme from their selection of most popular themes. Or you can bring your own. All of them can be customized. They also have a good selection of 1-click installation for popular plugins too. And they take care of all the security and maintenance. You can read more about it on the Web Savvy Marketing post. Do take care to note that this is for micro sites, not small business. I have no Earthy idea what that translates to, in terms of traffic limitations. And, I’m pretty confused as to how this compares to the Rainmaker platform and Synthesis managed hosting too. I’ve been getting emails from StudioPress about this for month now and they have done a pitiful job of giving us details. I have no idea whether to recommend it to my clients or not. What I do know is that a lot of folks who jumped onto Rainmaker or Synthesis are sorry they did and left it. This new venture is made by the same folks. So, I’m taking a wait and see stance on it. There’s another post with a brief on the details about it that you may want to have a look at too. Facebook has become a platform that no site owner can afford to ignore. Using automated tools to recycle your blog posts is no longer the ticket to success on it either. As I was reading this post on Social Media Examiner, I started seeing two patterns emerging. One focused squarely on all things video. The second focused squarely on direct sales and customer service. I’m no longer teaching my video classes, but Krishne De certainly is. And she stays right on top of everything that is happening on every platform too. I strongly encourage you to follow her everywhere. Start here on her Digital Marketing Insights home. You’ll find lots and lots of links to her presence on other platforms too. A recent UpDraft Plus update had a problem with older PHP versions. They patched it in latest release, so everything should be fine now. But, we’re going to start seeing more of this kind of problem with plugins as we slowly transition to PHP 7. PHP 5.6 is the latest stable version I recommend everyone get on for now at their host, as not all plugins and themes are ready for version 7. But, being on 5.6 will keep you from running into these upgrade problems because plugin devs are going to stop making them backward compatible below 5.6 at some point. Some plugins already require at least 5.4. I expect that to change as the year goes on. If you don’t know what you’re running on, check with your host, they can tell you. While researching pop ups and sticky bars to use on BlogAid, I noticed that the WP Hello Bar plugin has not been updated in a couple of years now. Now, this is different from the Hello Bar plugin. I have Thrive leads, but I honestly want something simpler to use than that. What sticky bars have you tried? Please do leave a comment on the blog or wherever you see this post online. Do you make money from affiliate marketing? If so, you know how ugly those links can be. That’s just one reason some folks choose to cloak them. It’s a way of making them shorter and prettier. Well, there’s a lot more to it than that, including laws and Terms of Service that you need to abide by too. Team Yoast has a nice post on affiliate links from an SEO perspective that you’ll want to read. It mentions one of the caveats of using a plugin for the redirects, which is speed, and a handy GitHub script to speed things up. I’ll add a little to that to say that the Pretty Links plugin and the Redirection plugin will both do the redirects for you and make these pretty links, but they are very different in their use of logs. And those will chew up your database over time. With Redirection, you can elect to turn the hit and 404 logs off. With Pretty Links, it has bunches of logs for tracking way more than hits. And none of those logs can be cleared. But, if you’re a big affiliate marketer, then you need those analytics to see what’s performing best for you. 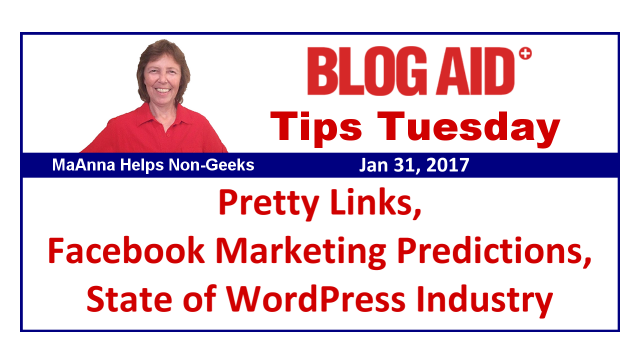 If you’re not an affiliate marketer, don’t use Pretty Links. User Redirection and turn off those logs. If you’re making redirects just to have a pretty, short URL to a landing page or such, there’s a better way to do it, and no plugin or redirect required. See this quick MaAnna Minute video for how to simply change the permalink of the page when you first create it. I know designers are super fond of using an FTP client to upload and download site files. I used CoffeeCup eons ago. But have been using Filezilla so long that I didn’t realize there were so many new FTP clients. In this post from WPBeginner, with 6 of the top FTP clients reviewed, I was sorry to hear that Filezilla has gone to the dark side for new installs. Mine needs an update right now and I’ll be checking for that setting they mention to be sure it’s turned off. Woohoo!!! I’m so excited to tell you that I finished my research and testing for all the code that needs to go into the security header of your site once you convert to HTTPS. And a B on SecurityHeaders.io. And B is a perfect score because the other two things they check for are not elements I recommend adding unless you want a can of worms to have to maintain. No thanks. A B score suits me just fine. This is the kind of thing I do for all of my site conversion clients. And, it’s what I teach designers to do in my Webmaster Training course too. Oooooo, Michael, Privy looks interesting. I might have to get an account just to give it a go. Optins and landing pages! That looks like it’s worth trying. Thank you! !